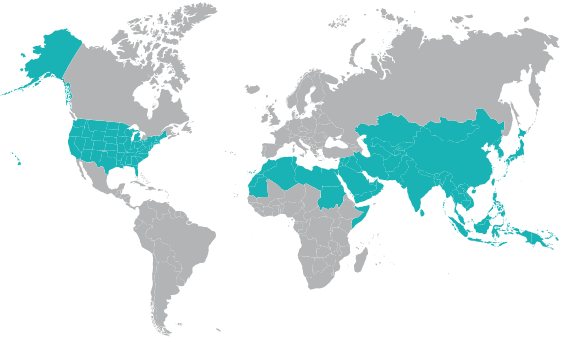 The Arab World includes 22 countries covering parts of two continents (Africa and Asia) and their islands – from Morocco in North Africa through the Arabian Peninsula. Three of the world’s major religions – Judaism, Christianity and Islam have been birthed in this area. Holy sites for all three religions are found in these countries presently dominated by Islamic rule. Arab refers to people who speak the Arabic language and adhere to an Arabic way of life. There are many differences among these people but they have a common bond of history, culture and tradition. Arab peoples love to read and hear their language. These scenic countries have lovely seacoasts, rich costal plains and cool mountains, which vie with nearby deserts. Concerns include the environmental scarring due to wars and improper use of resources. Pray for the Christian minority, that they would be strong in their walk with the Lord and increase in numbers. Surrounded by India on three sides and the Bay of Bengal on the south and Burma on the southeast, Bangladesh lies mostly in the vast deltas of two great river systems with headwaters in the Himalayas, the Ganges and the Brahmaputra. Bangladesh gained independence in 1971 from Pakistan becoming a Parliamentary Democracy. The present Prime Minister is Sheikh Hasina. She was appointed in 2009. The climate is tropical; cool, dry winter (October to March); hot, humid summer (March to June); cool, rainy monsoon (June to October). The summer monsoons often flood the low lying land destroying villages, crops, animals and people. Water problems are common, including contamination of well water from naturally occurring arsenic. Deforestation, heavy over-population and soil depletion and erosion are major concerns. Pray for the Christian minority, that they would be strong in their faith, and that many would be added to their number. Pray for new avenues of work to be opened up. Central Asia is a group of countries which achieved independence from the USSR in late 1991. Most areas are arid or mountainous and do not support a large populations. The 50 + million people continue to be in economic and social crisis. Rising immorality and alcoholism creates a sense of despair. Large Russian minorities throughout each of the countries contain many Christians mostly from Orthodox Christian traditions. However, more indigenous fellowships are being planted. Historically Islamic before communism, many people are searching for spirituality and are also turning to Islam with many new mosques being built. Other new religions are also finding a following. Pray for the Christians to develop a strong sense of integrity so that they may be salt and light. Pray the young people that they would continue searching to find true spirituality. This area includes all of eastern Russia, China, Japan, Korea and Taiwan some small countries sandwiched between Russia and China, some countries on China’s southern border and all of the islands related to those countries. It includes high deserts, major river valleys and deltas and some of the highest mountain ranges in the world. Some areas are extremely overpopulated and other areas have a very low population density. The major religions of this area are Shamanism, Buddhism, and Taoism. In some areas Christians are persecuted but in other countries the church has freedom to worship openly. Pray for the Christians to develop a strong sense of identity with Christ and a willingness to suffer. Pray that countries that now persecute Christians would relax their concerns and that the church would have freedom to worship openly. Pray that existing churches would develop a vision to reach out to serve other people groups near them. The Islamic Republic of Pakistan was formed in 1947 when British India was divided into East and West Pakistan and India in order to meet the need of Muslims in British India for their own Muslim states. In 1974 East Pakistan seceded and formed Bangladesh. West Pakistan then became the Islamic Republic of Pakistan. India and Pakistan are still in conflict over the border in Kashimir. Asif Ali is the head of government of over 140 million people. The government qnd military leaders are struggling to control domestic insurgents, many of whom arelocated in the tribal areas adjacent to the borders of Afghanistan. Urdu is the official language but is the mother tongue of only a minority of people with Punjabi being the most widely used language. English as well as Sindhi and other languages are also used depending on the area. About 97% of the people are Muslim with the rest being Hindu and a smaller number of Christians. Pray for unity among the Christians. Pray that the persecution of Christians will be stopped. This area includes some of the most populous countries of the world with over a billion people. Pray for unity among the believers. The beautiful, tropical countries lying between the Indian and Pacific oceans vary in their level of development. Some are recovering from war; others have areas that have become tourist hot spots. Hundreds of people groups each with their own language fill these regions. Many suffer from poverty, injustice and great spiritual need. In some countries Buddhism predominates, in others Islam. Although in isolated areas the church has grown dramatically, Christians can face severe persecution. Pray for those suffering from the effects of natural disasters. Known for its warm hospitality, West Asia once cradled the early church. This bucolic region has a strong agricultural sector, good infrastructure and growing urban centers. Though many are secularists, the majority religion is Islam. Christians are very scarce and few people have ever met one. Conflict from nearby areas has caused an influx of 4.8 million refugees and created a grave humanitarian crisis which has strained local resources. There is opportunity for Christians to partner with local people to assist refugees and to bring a message of hope. Pray that those working with refugees will have resilience and creativity. Pray for government stability and for peace in the region.